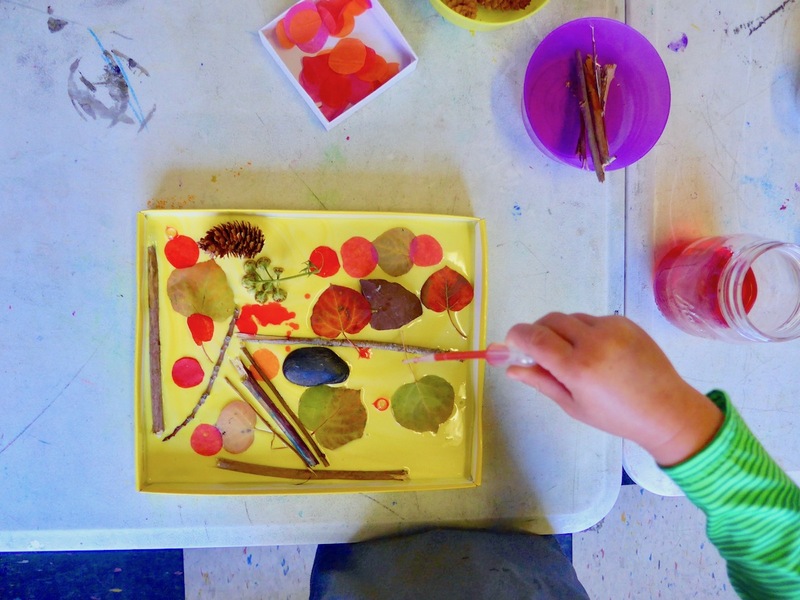 Collecting and creating art with pieces of nature encourages us to observe the changing seasons and engages our senses. 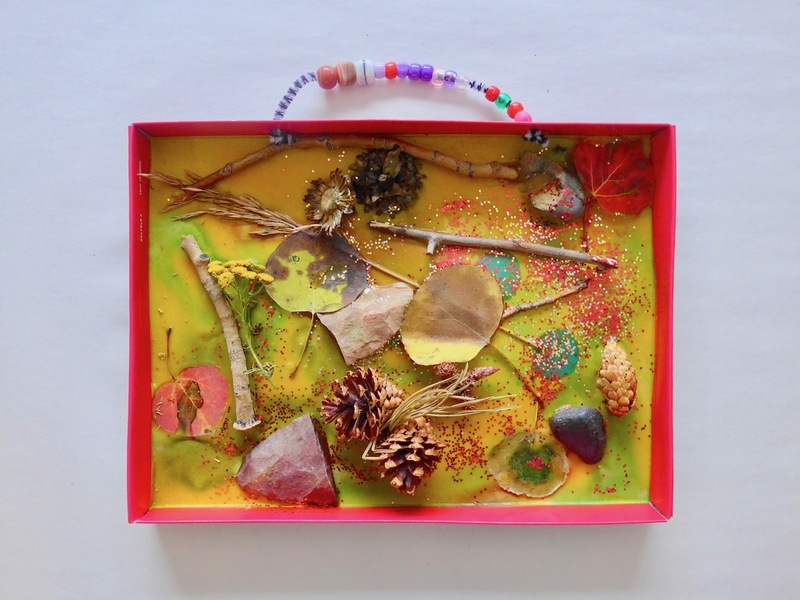 During nature walks the children like to collect leaves, pinecones, sticks and small rocks etc. 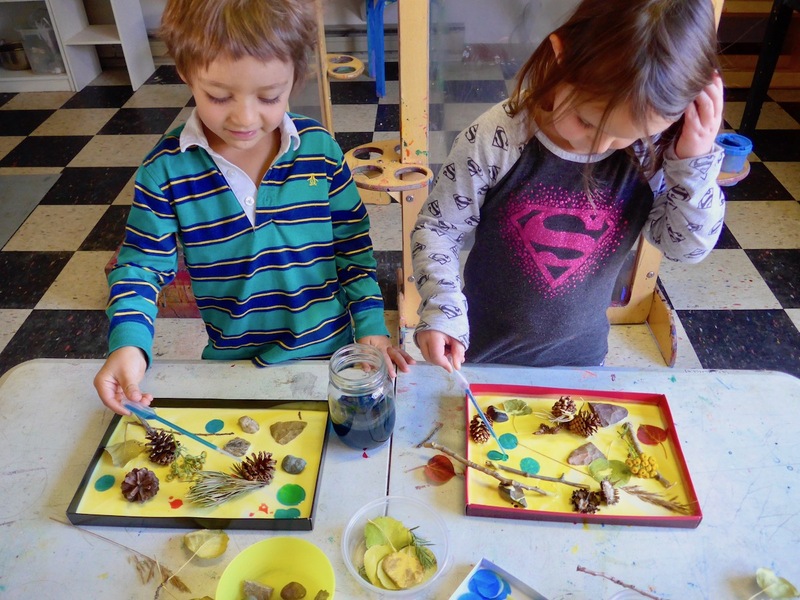 We talk about the different colors, shapes and textures: “Some of the pinecones are spiky!”, “The wood is so soft!” etc. 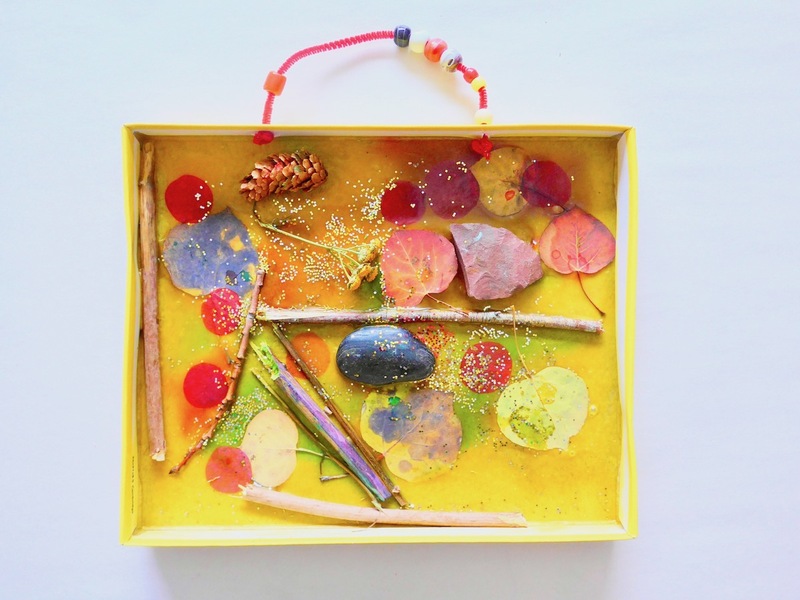 Inside we keep a basket to collect all our little treasures. 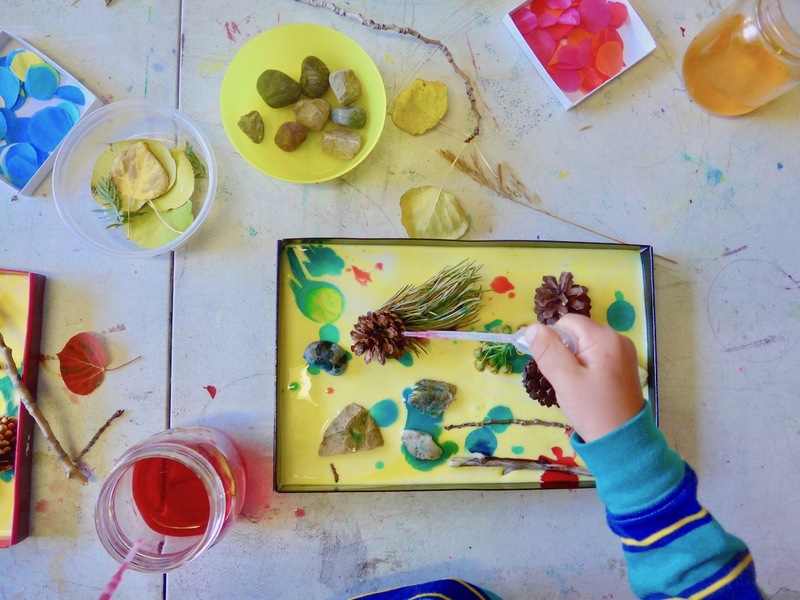 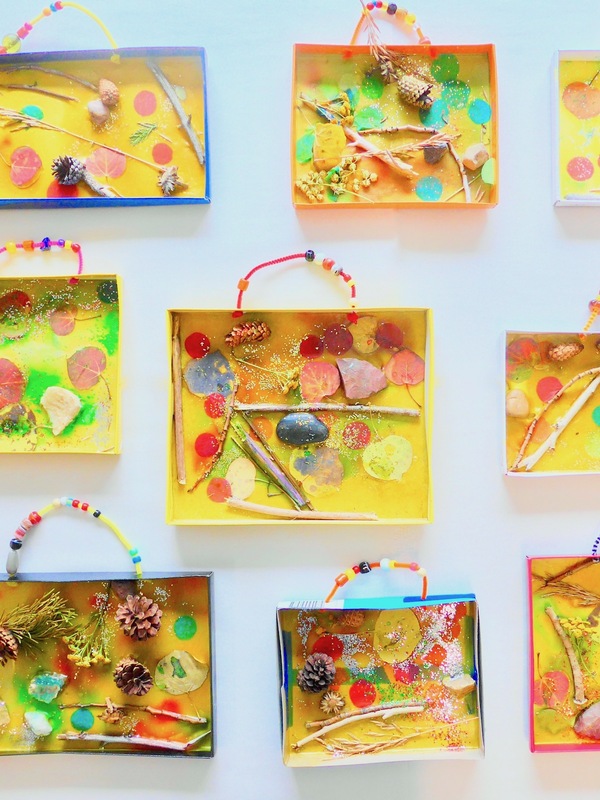 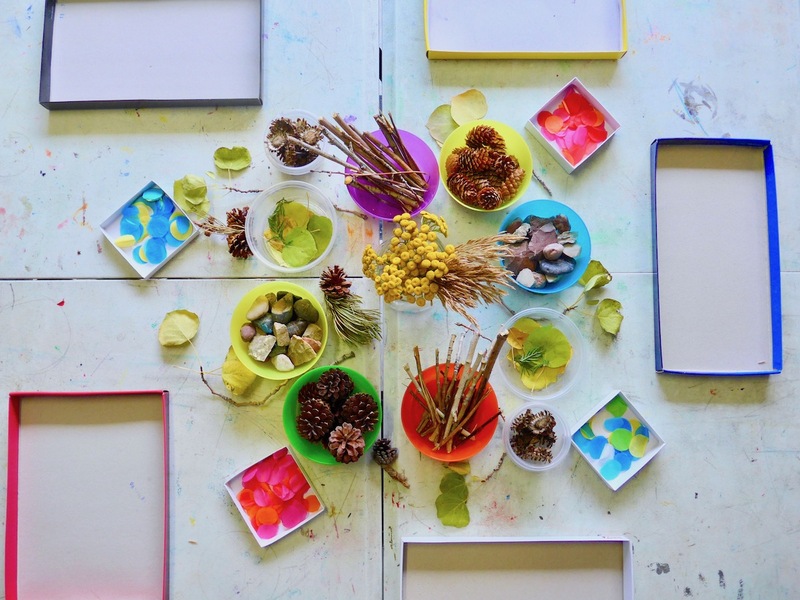 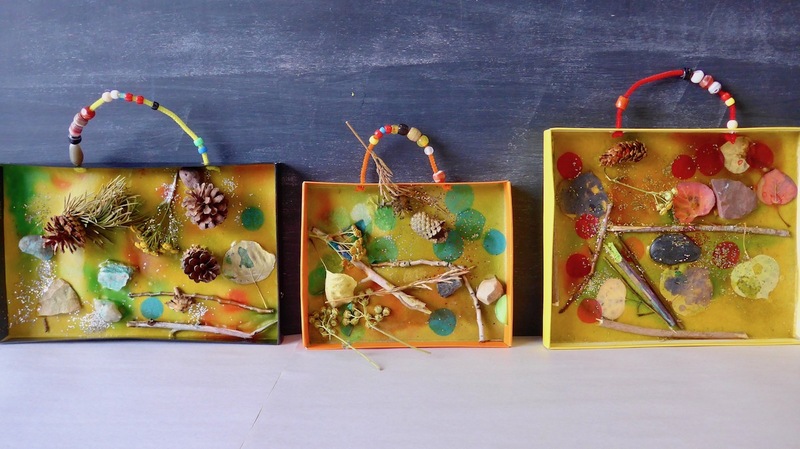 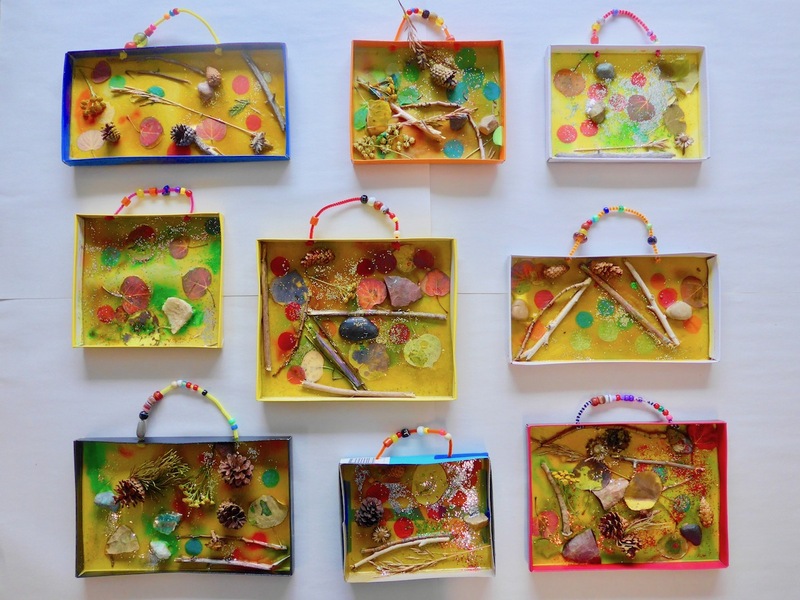 We’ve been creating a lot with pieces from that basket but these Autumn Shadow Boxes by the lovely Deborah from TeachPreschool are one of our favorite projects for keeping our found treasures. 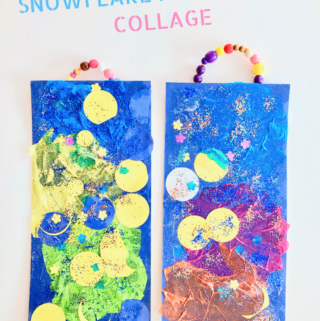 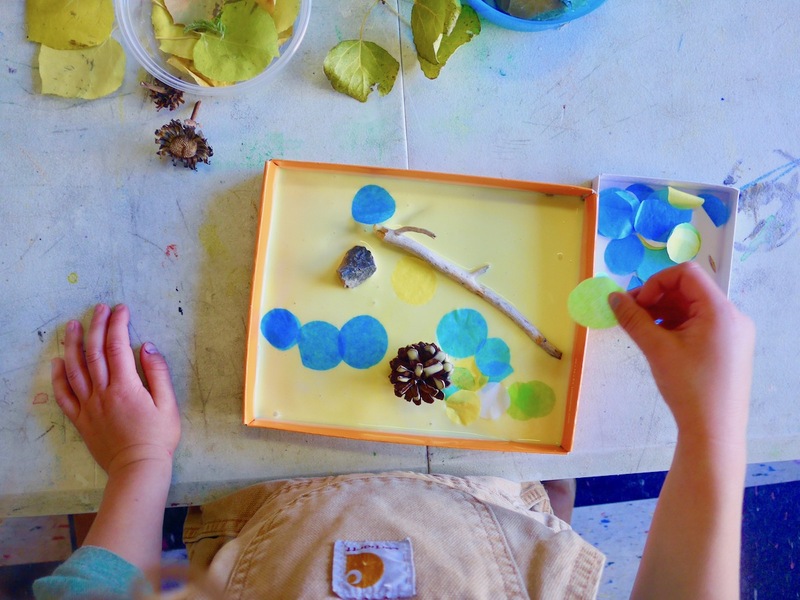 Head over to TeachPreschool for a list of supplies and full step-by-step instructions (as well as other fantastic teaching tips and well thought out preschool ideas). 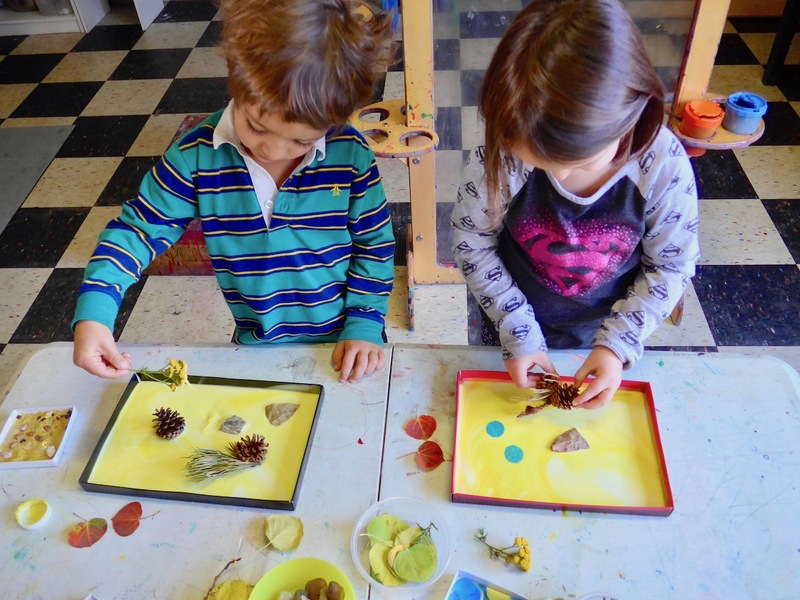 Instead of using white glue we colored ours with yellow. 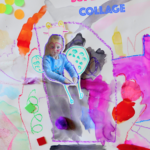 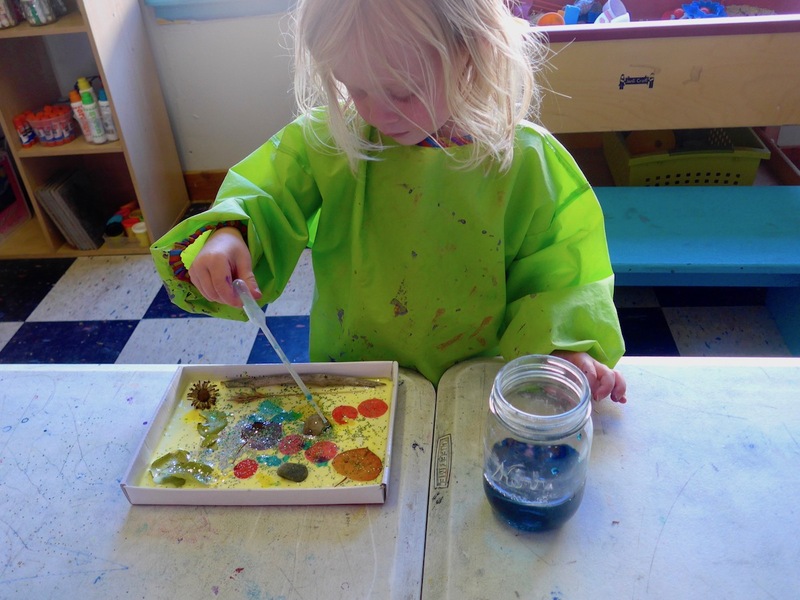 Simply add a few drops of food coloring to a bottle of school glue. 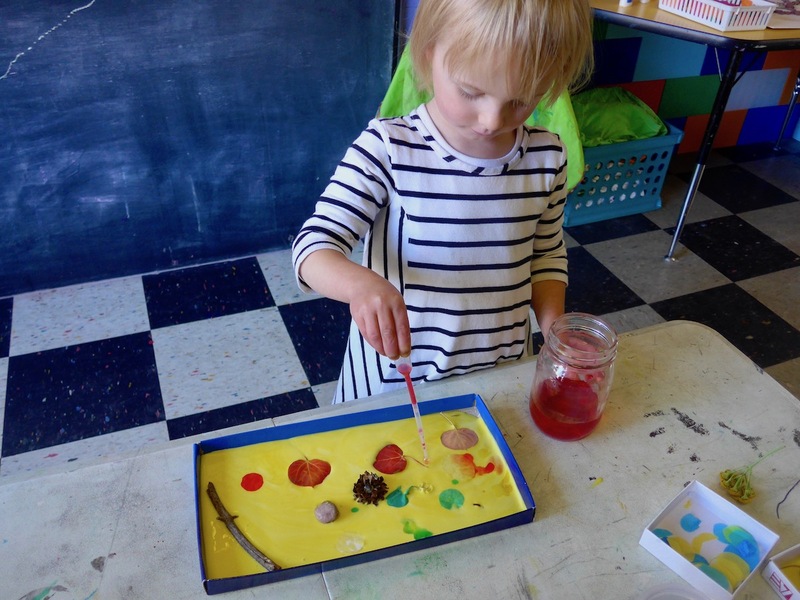 We also used droppers instead of paintbrushes, liquid watercolors instead of tempera paint and added tissue papers and glitter. 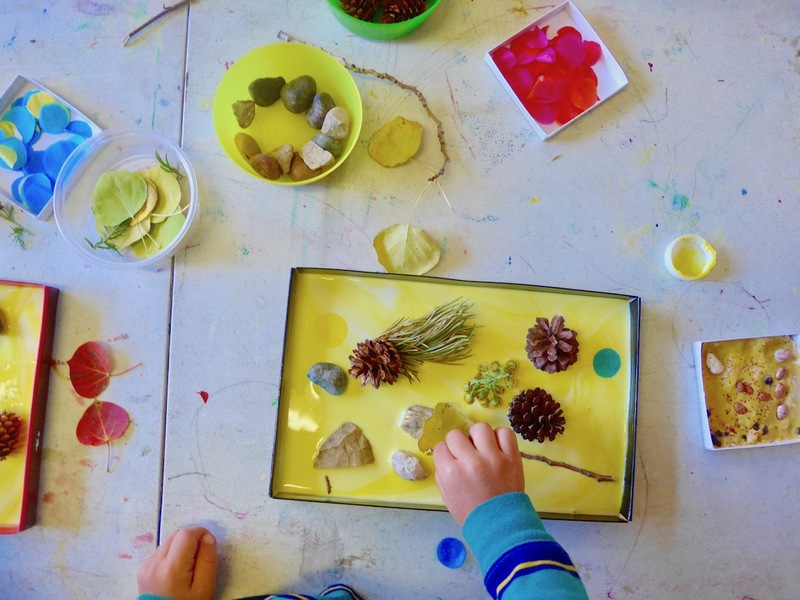 We sorted our nature findings into small bowls and set them out on the table. 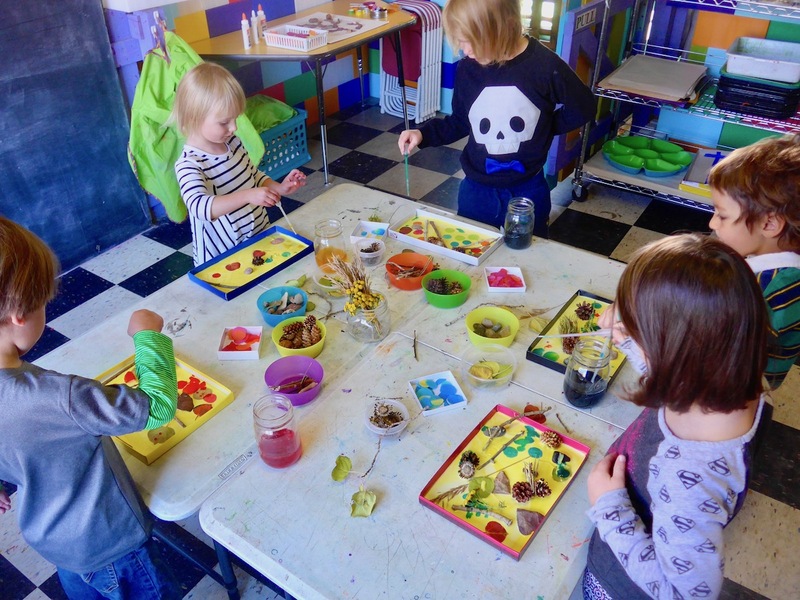 We also set out tissue paper shapes and glitter shakers. 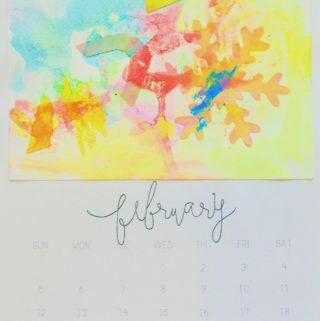 To make liquid watercolors, mix some water with just a few drops of liquid watercolors until you like the hue and intensity of the color and add a dropper to each glass. 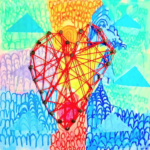 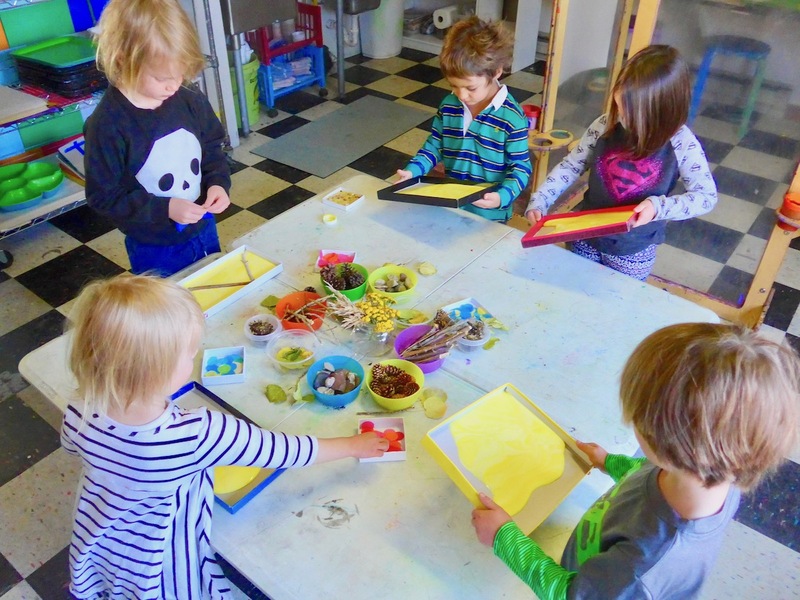 We used one color at a time and discussed how we can ask each other kindly for turns with the colors, how to work out a trade and established that it’s ok to say “I’m using this color right now, you can have it when I’m done!”. 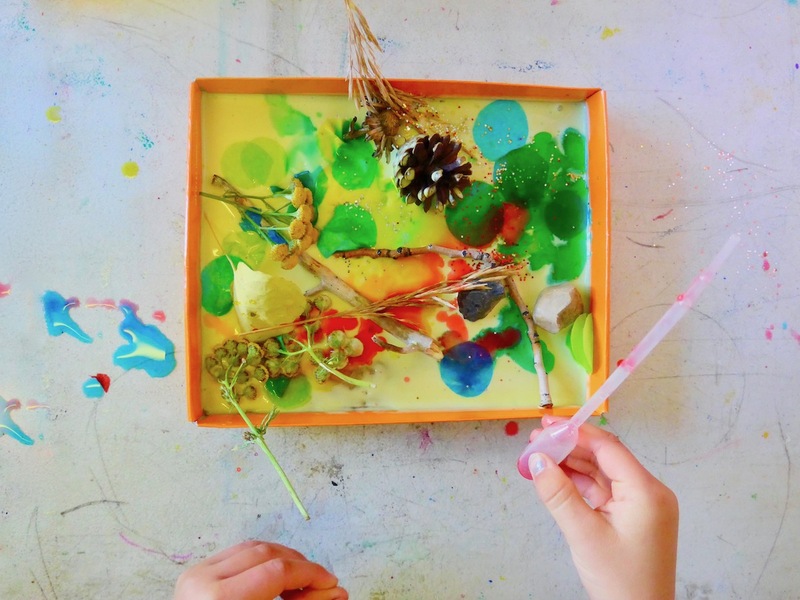 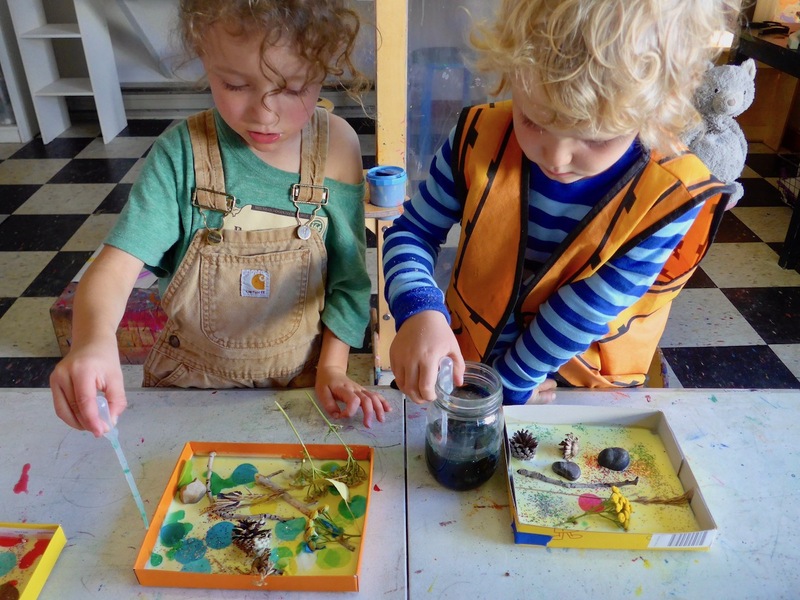 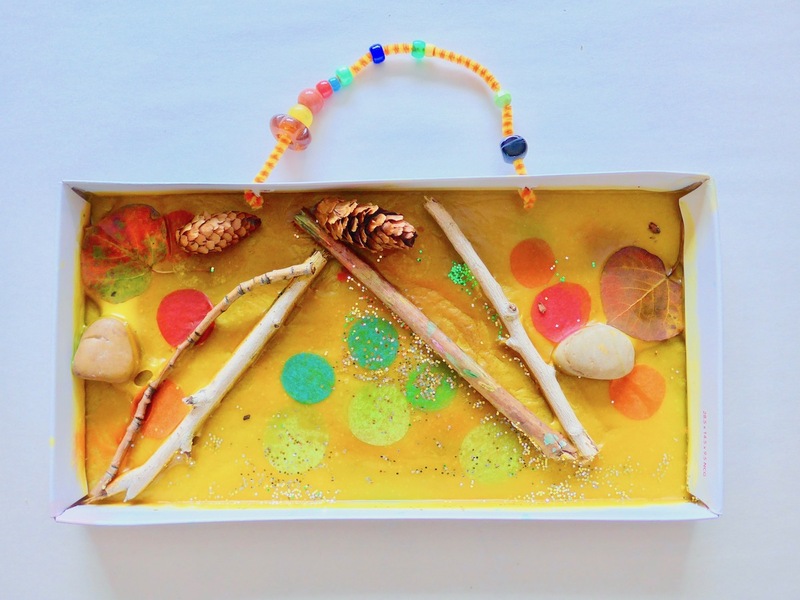 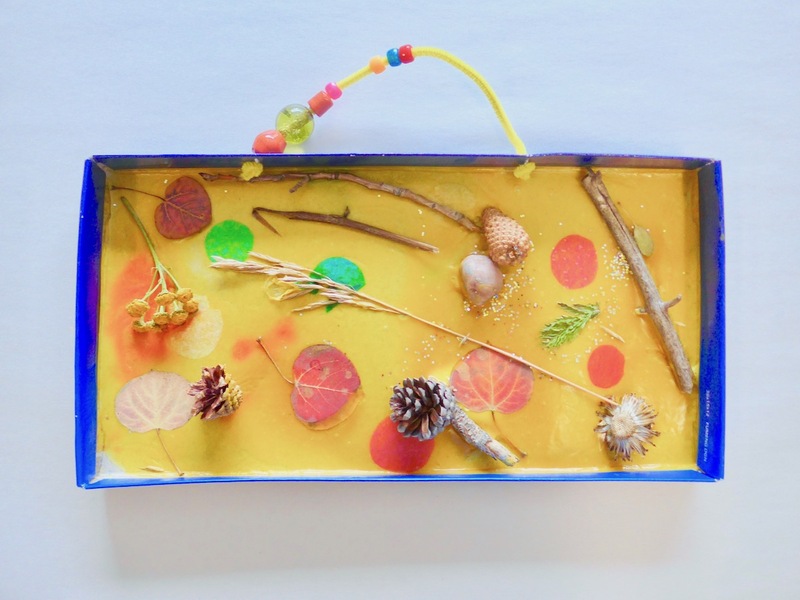 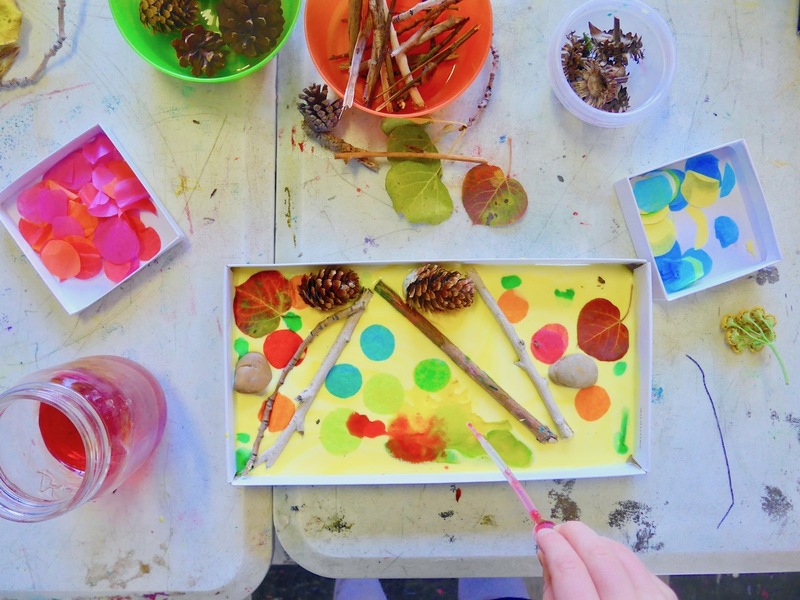 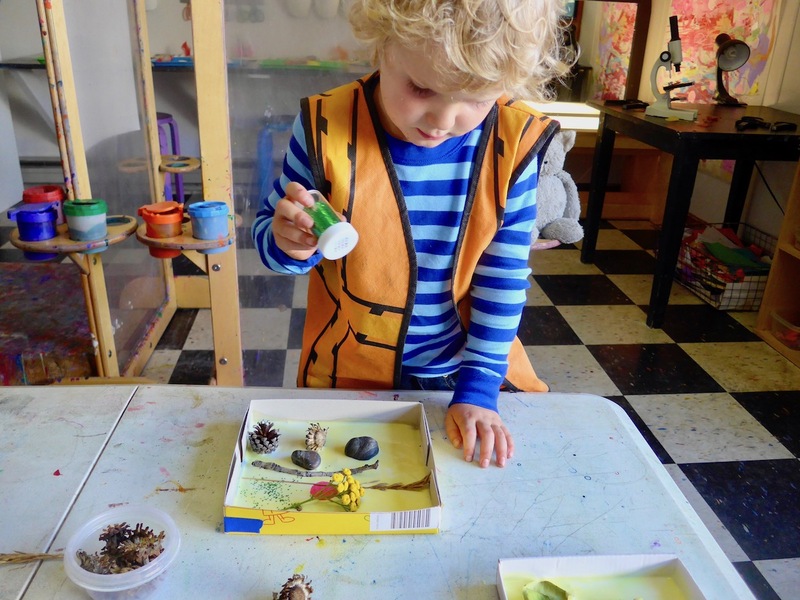 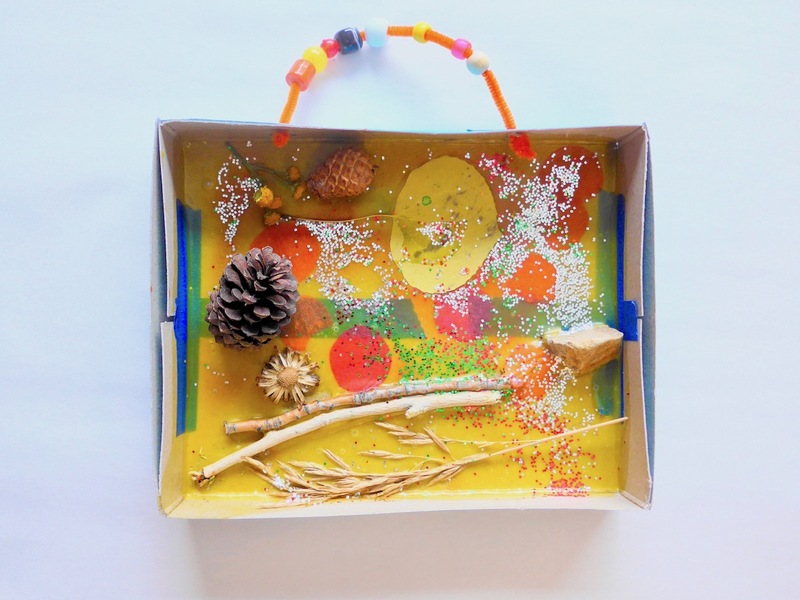 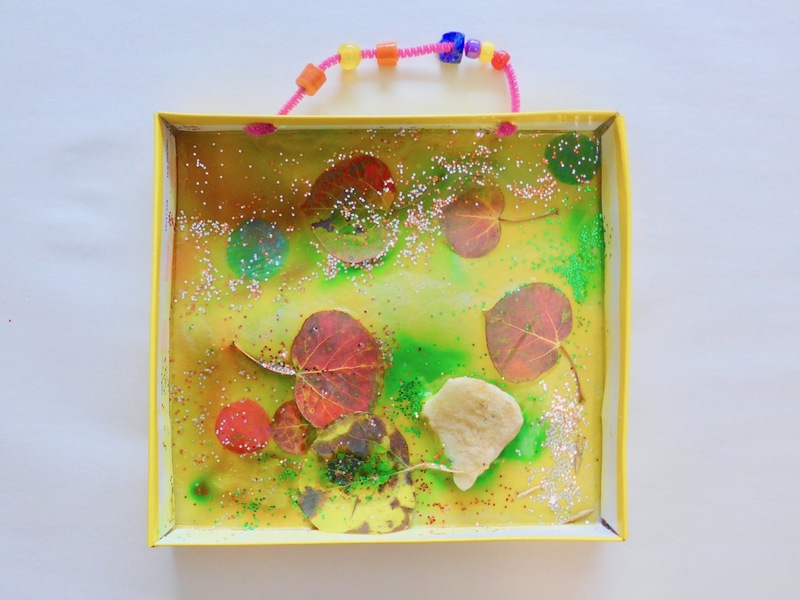 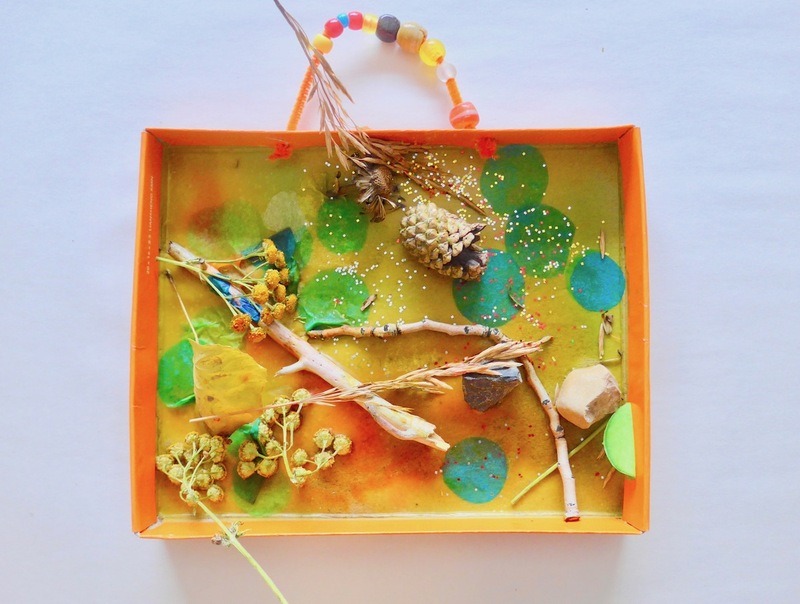 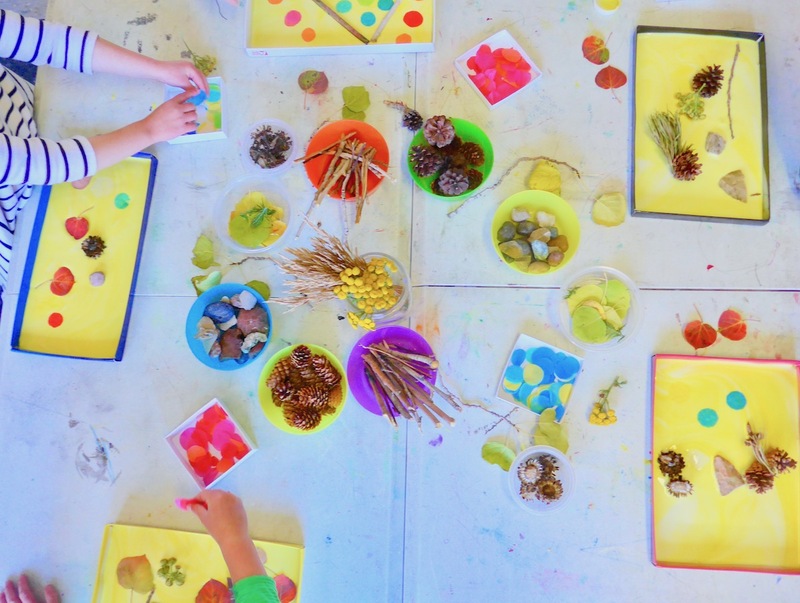 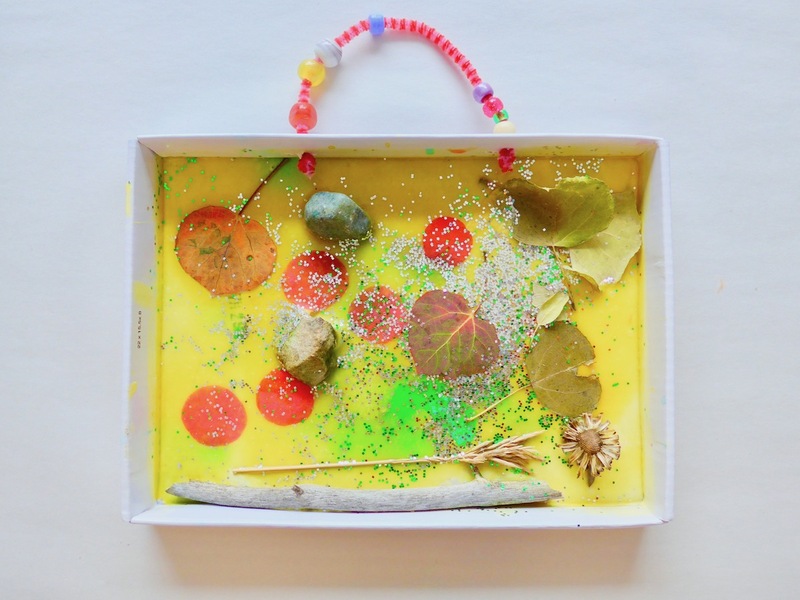 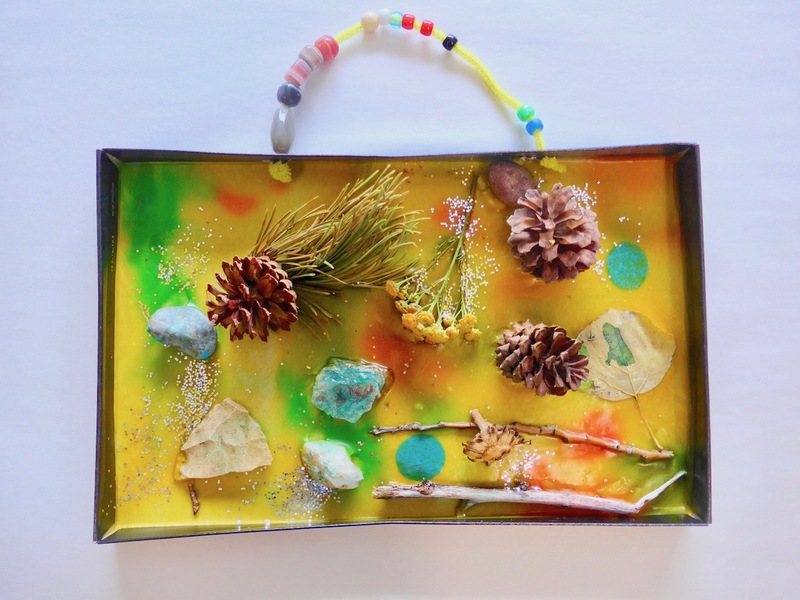 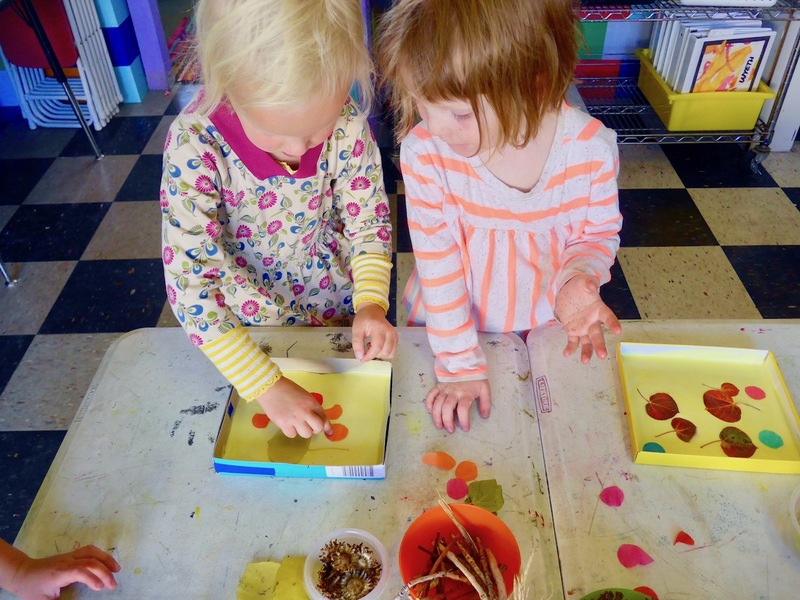 The children poured the glue themselves (they took turns and moved their shoebox around to spread the bottom of it), freely arranged their autumn treasures and loved using the droppers to add some autumn colors. 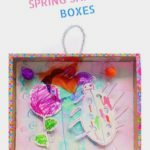 You can attach beaded pipe cleaners as hangers (use a x-acto knife to cut holes in the shoe boxes beforehand). 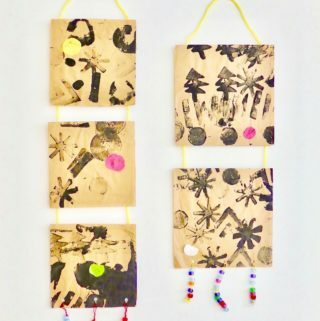 I bet mommies will be happy about those! 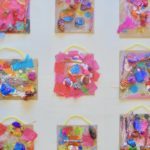 Thanks TeachPreschool, these are too good to not share! 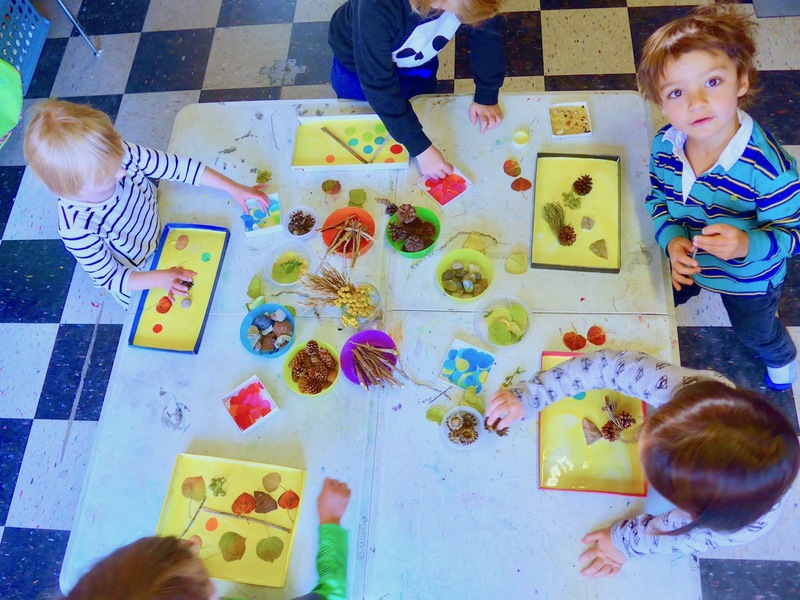 I hope you have as much fun with this as we did!